This 14-acre park is on the National Registry of Historic Places and is filled with automotive history. 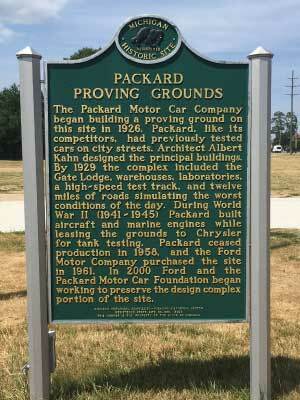 Established in 1927, the Packard Motor Company operated on the grounds until 1956 when financial conditions forced it to consolidate to other facilities. The site has Albert Kahn designed buildings, featuring industrial style and accents, and it open to the public and available for private tours. Every Saturday from may through October that is a farmers market filled with local products and locally grown produce. Weddings, corporate events, and other social occasions can be booked and offer a unique and historic location for a memorable event. The Packard Motor Car Foundation is a non-profit organization dedicated to education and preservation of the history of the Packard Motor Car Company property and products.